Forget what you think you know about opera – Il Viaggio a Reims, currently on stage at the Baxter, is smashing through traditional ideas of operatic theatre with all the energy of a hungry paparazzi mob. It requires a very talented creative team to take an opera which premiered in 1825 and features a Euro-centric historical and political drama, and reanimate it for a South African stage in 2014. 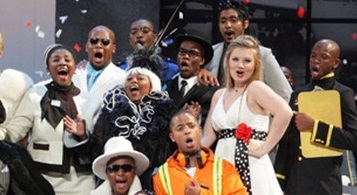 But Cape Town Opera has succeeded with considerable flair. Matthew Wild is the director hot on everyone’s lips with his other smash hit The Rocky Horror Show still drawing the throngs to the theatre. Il Viaggio a Reims (‘The journey to Reims’) is a crazy night of international ego-jostling, as a dramatic and demanding bunch of B-list celebrities (including a fashionista, a poetess, a soccer player and a womanizer) await a flight to the inauguration of the new French president. Under Wild’s direction, each of these pseudo superstars struts a defined character while belting out arias in Italian, and together with Leopold Senekal (set and costume designer) they create a pop-art world of complete political neutrality: a bold, bright airport lounge, supported by a choir of airport staff. What is striking, when listening to these young men and women hit impossible notes with sniper-like perfection, is the depth of South African talent that is being developed. Conductor and director of the UCT Opera School, Kamal Khan, is doing a stellar job bringing out powerful voices from our home-grown honeys, and the hard work pays off. Some of the lead characters in the current production came from the choir of the very same opera when first shown at the Baxter in 2010. Over and above their acrobatic voice range, the members of the main cast (which stands 17 strong) each inhabit their wacky, obsessive characters with considerable gees. The characters are self-involved, flirtatious, overly dramatic (multiple, side-splitting faints) and very obsessive – whether about the contents of their fellow travellers’ suitcases, about winning the heart of a woman or about finding the right dress for the evening. It is nearly impossible to choose favourites, but some characters that particularly stand out are Don Prudenzio (Martin Mkhize), the airport paramedic with illusions of grandeur, who sings to and of himself, praising his greatness before erroneously declaring the death of Contessa de Foleville (alternately played by Maudee Montierre, Lisa Thor and Leah Gunter). The fashion-crazed French Contessa takes the cake with her elaborate Gaga-esque outfits and exaggerated issues and her flirty entourage. Her raunchy affair with a French officer, revamped for 2014 in white pimpster gear with gold bling swinging from his neck (Makudupanyane Senaoana and Khanyiso Gwenxane) is threatened by his secret lust for the Italian singer/songwriter Corinna (Janet Speelman and Linda Nteleza). In between all the serenading and flirting and over-the-shoulder jealousy, a special shout-out goes to Sakhile Humbane, the flautist who steps up from the UCT symphony orchestra in the stage pit to rock his transverse flute onstage, helping Lord Sidney (Bongani Kubheka and Johannes Slabbert) to lure Corinna out onto the balcony where he can proclaim his love – if only he has the guts to do it. There’s not much that Il Viaggio a Reims can improve on, but hearing the Cape Town Opera and UCT Opera School break out some ‘Nkosi Sikelel’ iAfrika’ (even in Italian) would take it to a whole new level. Make sure you catch one of the five shows at the Baxter – you’re going to remember this one for a long time. Cape Town Opera and UCT Opera School’s Il Viaggio a Reims runs at the Baxter from 26 to 30 August 2014. 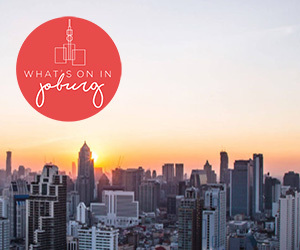 Copyright © 2018 What's on in Cape Town. All rights reserved. The information contained in this website has been obtained from sources believed reliable. If you spot an error, please let us know. We cannot be held responsible for inaccuracies.